Here is a landmark 100th release of Asymmetric Recordings. A huge milestone to reach for any label, so what better way to celebrate than with one of the label head honcho's at the helm accompanied by the igniting vocal performance by Mz Sunday Luv (Get Physical, Rebirth). Lonya has been constantly proving his worth as a DJ, Producer and label owner for many years, and this release will help cement his strength in every aspect. 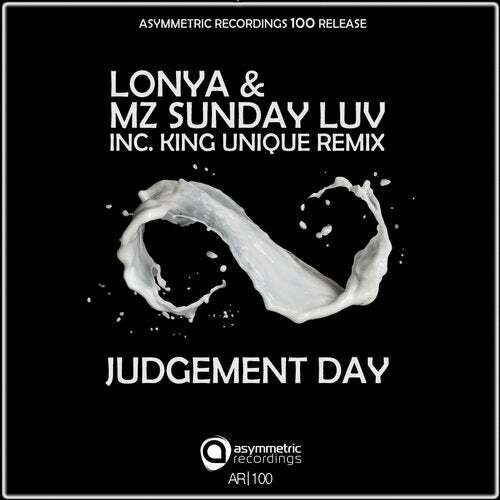 Judgement Day is and emotive yet driving workout, fusing beautiful and deep vibes, with powerful dance floor touches. Locking you in to its magical spell, this sets off effortlessly, grooving along, until the magical vocal caresses the soundscape to create a mesmerising gem of a track that oozes of class. Remix duties see the ever reliable, and always exciting King Unique take control. This remix takes us in to deep and deadly territories, adding a filthy distorted bass, a cascade of trippy fx and superb use of the vocal to create a serious rework. This gem straddles many a musical genre and is no doubt going to do some serious damage over the summer and beyond.